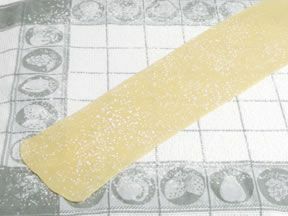 A hard surfaced kitchen tool that is generally made of wood, wood laminate, composites, or plastic materials and is used as a surface for cutting, slicing, chopping, or mincing food products. Wood, composite materials and plastic (polypropylene, polyethylene, polyacrylic, and polystyrene) Boards come in a wide variety of thicknesses, shapes and sizes to fit a variety of different preparation and storage needs. Some Cutting Boards contain a groove around the entire surface of the Board, which allows food juices to be retained so they don't spill onto the adjacent surfaces. Wooden Cutting Boards must be thoroughly washed after food has been prepared on the board, since wood has a tendency to retain food particles or absorb moisture that can cause bacteria growth resulting in Salmonella and E. coli. illnesses if not removed. 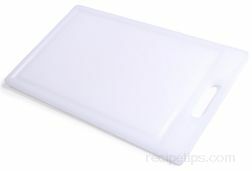 Colored plastic Cutting Boards are commonly made of a poly substance that is soft and not damaging to knives as well as washable and dishwasher safe for thorough cleaning. However, like wood, bacteria can also grow on plastic. Therefore, the most important rule is to always clean the Board thoroughly after each item of raw meat, poultry, fish, shellfish, and other foods have been placed on the Board so they do not cross contaminate another item. Wooden Cutting Boards will have a tendency to become dry and crack as they age. 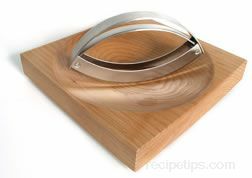 Periodic use of a food-safe or food-grade mineral oil available at drug stores, helps to restore the Cutting Board. The oil can be rubbed into the wood to lengthen the life of the board and assist with keeping the board from drying out after repeated washings with water and solvents. It is often suggested that the mineral oil be warmed first by placing the bottle containing the oil in a bowl filled with warm water. Allow the oil to warm to the water temperature and then moisten a soft cloth with the oil and rub it onto the board. 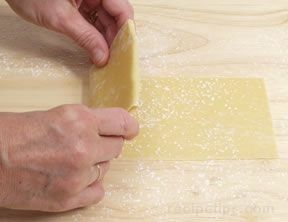 After the oil has remained on the Cutting Board for 4 to 6 hours, wipe off the excess oil and allow the Board to cure overnight before using. Consider using separate boards for each different food category being prepared, such as meats and seafood while using other Boards for vegetables and fruits that are not being cooked. When preparing food on one side of a Cutting Board, don't turn the board over to use the reverse side to prepare new ingredients, thinking that the other side may be clean and free of contaminates. Most often the reverse side will not be clean. Always clean the surface and sides of the Board after foods have been prepared on the Cutting Board by using a combination of hot water and a soapy cleaning solution. Rinse the Board thoroughly. It is also advisable to periodically sanitize the Board with a cleaning solution made from a teaspoon of bleach or undiluted white vinegar added to a quart of water. Apply the sanitizer solution liberally, allowing it to completely drench the Board and then air dry or wipe dry. Boards can also be cleaned deeper by placing plastic boards in dishwashers as other utensils are being cleaned. 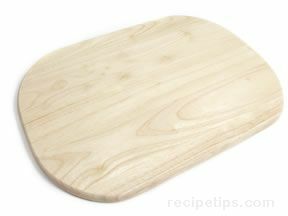 Wooden Cutting Boards can be placed in a microwave oven for 5 minutes. As the Cutting Board ages and begins to develop deeper score marks that can hold bacteria, it is a good practice to discard the old Board. Bacteria can remain in the cracks or crevices of these boards, despite a thorough cleaning, so it is important to realize when to replace Boards that show excessive wear from knife marks.